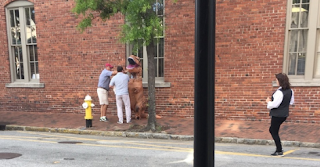 Charleston police: Person in dinosaur costume allegedly growls at carriage horses, throwing driver to the ground | Crime Stoppers of the Lowcountry: 554-1111 | 1-888-CRIME-SC | Anonymous tips earn cash rewards with Crime Stoppers of the Lowcountry. A person dressed as a Tyrannosaurus rex startled a pair of carriage horses in downtown Charleston on Thursday, injuring one of the horses and the driver. 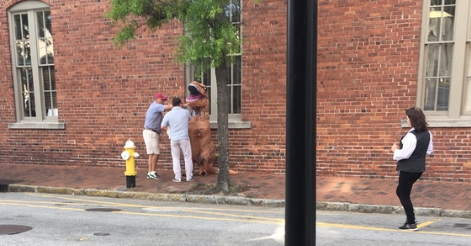 The orange T-Rex was spotted walking south on Church Street just ahead of the horse drawn carriage, according to the police report. Police say the costumed assailant allegedly started growling at the horses in front of Tommy Condon's restaurant. 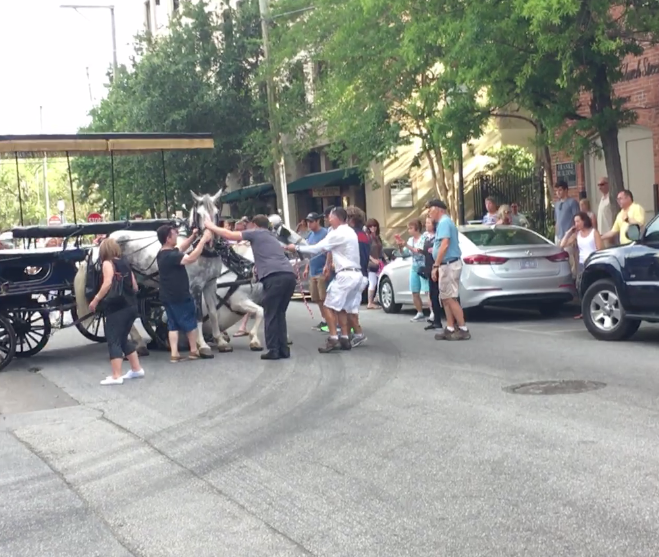 According to Bill Bailey, a public relations representative retained by Palmetto Carriage Works, the carriage was nearing the end of its tour route and the driver shouted at the character, warning that its antics would scare the horses. But the theropod's apparent snarling spooked the horses, causing them to back up and jackknife the carriage, Bailey said. One horse, named Yogi, fell, and the driver was thrown out of the carriage. A wheel rolled over one of the driver's legs, and he was transported to the hospital with minor injuries, according to the police report. The Bailey said the person in the costume ran off. The carriage was carrying a full load of passengers, 16 in total, but none were injured. Bailey said Yogi got up immediately and had only a few cuts and scratches. Both horses were back at the Big Red Barn, he said, and a vet was expected to check them at 9 p.m. The other horse's name is Boo Boo. "The concern is that this is a new tactic that animal rights activists are employing," Bailey said. "That's something that has no place in this city and should be condemned by the city's leadership." Shelby Salvador and her husband, Gary, watched the scene unfold from their corner table at Tommy Condon’s. “We saw a dinosaur walking down the street,” Shelby said. It was weird, she said, so she took out her camera to take some pictures. That’s when Shelby noticed the carriage horses trotting in the direction of the dinosaur. The horses stopped dead in their tracks, Shelby said. The T-Rex was also “frozen in place,” according to Gary. “She was frozen. She didn't leave,” Gary said. “She just stood like ice right there."